The Giants let Wednesday's deadline pass without picking up the second-year option on Stewart's (foot) contract, Jordan Raanan of ESPN.com reports. Analysis: As expected, Stewart hits the open market six weeks before his 32nd birthday. He's believed to have made a full recovery from the foot injury that landed him on injured reserve in 2018, but he'll have a hard time getting offers for much more than the veteran's minimum. It won't come as any surprise if Stewart decides to retire. Stewart (foot) will become a free agent when the Giants decline to exercise the option for the second season of his two-year contract, Dan Duggan of The Athletic reports. Analysis: It's a foregone conclusion the Giants won't exercise the option before the Feb. 4 deadline, instead moving forward with Saquon Barkley and Wayne Gallman in the backfield. The 31-year-old Stewart seems to have recovered from the foot injury that landed him on injured reserve in late September, but the Giants didn't see any reason to bring him back to the active roster. He likely will need to battle for a depth job if he intends to continue his career. Stewart (foot) isn't practicing Wednesday and will revert to injured reserve, ending his season, Ryan Dunleavy of NJ.com reports. 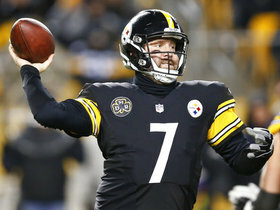 Coach Pat Shurmur said Wednesday that Stewart (foot) is "ready to go" if the Giants need him for Sunday's game against the Bears, Jordan Raanan of ESPN.com reports. Stewart (foot) returned to practice Thursday, opening a 21-day window for the Giants to evaluate him for a return to the 53-man roster. 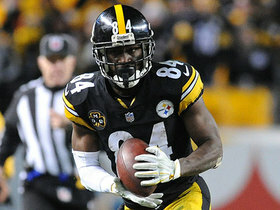 Stewart (foot) is expected to face an eight-week recovery period, with head coach Pat Shurmur stating that there is 'potential to bring him back' from injured reserve, Jordan Raanan of ESPN.com reports. The Giants placed Stewart (foot) on injured reserve Friday, Michael Eisen of the team's official site reports. Analysis: The nature of Stewart's foot injury is unknown, but it's serious enough that a lengthy recovery effort is expected. If this is the last down he plays in 2018, he'll finish the campaign with six carries for 17 yards. Moving forward, look for any RB touches not allotted to Saquon Barkley to go to Wayne Gallman. Stewart (foot) has been ruled out for Sunday's game against the Saints, Art Stapleton of The Bergen Record reports. Analysis: This shouldn't have much impact on the Giants' game plan, considering Stewart had just six carries on 17 snaps after three games. Wayne Gallman could get a few more touches than usual behind workhorse Saquon Barkley. Stewart missed Wednesday's practice due to a foot injury. Analysis: Stewart played just two offensive snaps in the Giants' Week 3 win over the Texans, rushing twice for eight yards. The bulk of the backfield work has fallen to rookie Saquon Barkley and Wayne Gallman through the Giants' first three games, so Stewart's uncertain status for Sunday's game against the Saints won't have many fantasy implications. Stewart carried the ball two times for eight yards in Sunday's win over the Texans. Analysis: That makes two straight weeks with just two carries for Stewart, and it looks like he is the clear No. 3 in the Giants' backfield pecking order, as Wayne Gallman carried the ball six times Sunday. Injuries will be the only way Stewart becomes a legitimate fantasy option this season. Stewart carried the ball twice for one yard in Sunday's 20-13 loss to the Cowboys. Analysis: Stewart logged just five offensive snaps -- the same amount as fellow backup Wayne Gallman -- Sunday night, and while he outpaced Gallman in carries two to one, Gallman recorded one catch for 11 yards out of the backfield. Regardless, given the high usage of rookie star Saquon Barkley, there doesn't appear to be much of a role for either Stewart or Gallman in the backfield at this time. Stewart is listed as the No. 3 back heading into Week 1's matchup with the Jaguars, Paul Schwartz of The New York Post reports. Analysis: Stewart failed to impress during the preseason, which was highlighted against the Jets in Week 3, as Stewart ran the ball three times for minus-seven yards and also lost a fumble. Pair Stewart's poor performance with the upside of Wayne Gallman as a pass-catcher out of the backfield and therein lies the decision to make the veteran Stewart the No. 3 option. 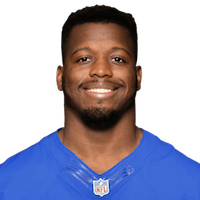 Stewart logged three carries for minus-seven yards and also lost a fumble in the Giants' 22-16 preseason win over the Jets on Friday. Stewart could be supplanted by Wayne Gallman as Saquon Barkley's primary backup, SNY reports. Analysis: Gallman is a holdover from the prior regime, but he played decently behind a bad line last year, is only 23 and is impressing his new coaches in camp. Stewart has a two-year $6.9 million deal and played for GM Dave Gettleman in Carolina, but he's 31 and hasn't been efficient in several years. Stewart is part of a New York backfield that now includes No. 2 overall draft pick Saquon Barkley, Dan Salomone of the Giants' official website reports. Analysis: After he was released by the Panthers on Feb. 28, Stewart initially drew interest from the Seahawks and Lions, but the Giants will end up with his services in 2018. The soon-to-be 31-year-old is the Panthers' all-time leading rusher with 7,318 yards, which he churned out at a clip of 4.3 YPC. At the very least, the Giants will utilize Stewart on first and second downs this season, but Wayne Gallman and potentially a 2018 draft pick will eat into his overall volume. Stewart and DeMarco Murray are scheduled for visits with the Lions on Monday, Adam Schefter of ESPN reports. Stewart, who was released by the Panthers last week, is slated to visit the Seahawks, the Seattle Times reports. The Panthers released Stewart on Wednesday, Bryan Strickland of the Panthers' official site reports. Stewart finished with 11 rushes for 51 yards in Sunday's 31-26 NFC wild-card loss to the Saints. Stewart (back) was a full practice participant Thursday, Steve Reed of the Associated Press reports. Stewart (back) was limited in Wednesday's practice, David Newton of ESPN.com reports. Panthers head coach Ron Rivera indicated that he's not concerned about Stewart's (back) availability for Sunday's wild-card matchup with the Saints, Joseph Person of The Charlotte Observer reports. "I think Stew will be fine," Rivera said Monday. "He told me he's feeling better already." Stewart told David Newton of ESPN.com that he missed Sunday's loss in Atlanta due to stiffness in his back. 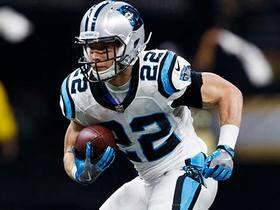 Stewart is inactive for the first time this season Sunday against the Falcons, as the running back is dealing with back tightness, Max Henson of the Panthers' official site reports. Analysis: Stewart missed the first practice of the week due to what was described as a day of rest, but returned to log full sessions Thursday and Friday and did not carry an injury tag heading into the regular-season finale. With Stewart on the shelf for a game with playoff implications, look for Christian McCaffrey to take on the role of lead back, with Cameron Artis-Payne next in line for running back snaps. Stewart rushed seven times for 19 yards and caught his lone target for a one-yard loss in Sunday's 22-19 win over the Buccaneers. Analysis: Stewart's Week 14 outburst is looking more and more like an anomaly, as he once again failed to top 3.0 yards per carry Sunday. The veteran's seven rushes also marked a season low, allowing rookie Christian McCaffrey to assume a larger workload on the ground for a second straight week. Following a crash back to earth, Stewart's Week 17 outlook doesn't appear favorable, as he managed just 21 yards on 11 carries against the Falcons earlier this season. Stewart rushed 11 times for 27 yards and caught his lone target for nine yards in Sunday's 31-24 win over the Packers. Stewart rushed 16 times for 103 yards and three touchdowns in Sunday's 31-24 win over the Vikings. Stewart (foot) was a full practice participant Thursday, Jourdan Rodrigue of The Charlotte Observer reports. Analysis: The Panthers have been deliberate with their usage of Stewart and Christian McCaffrey this season. Due to his varied skill set, McCaffrey has earned 68.4 percent of the offensive snaps, seeing 12.2 combined touches per game. Meanwhile, Stewart's share is 40.1 percent of the snaps on offense, which has translated to an average of 13.7 carries per. Despite his health not a question mark for Sunday's game, he'll find the going tough against the Vikings' second-ranked run defense. Stewart (foot) participated in practice Thursday, Bryan Strickland of the Panthers' official site reports. Stewart isn't practicing Wednesday due to foot and ankle injuries, David Newton of ESPN.com reports. Stewart took 11 carries for 45 yards and a touchdown in Sunday's 31-21 loss to the Saints. Analysis: Stewart got off to a fast start and scored from two yards out on the opening drive, but he went quiet in the second half when the Panthers were forced to play from behind. With just six catches all season and a lowly mark of 3.2 yards per carry, Stewart largely depends on goal-line touchdowns for his production. A Week 14 matchup with the Minnesota defense is sub-optimal for his role. Stewart ran for 26 yards and a touchdown on 15 carries in Sunday's 35-27 win over the Jets. Analysis: Stewart's two-yard plunge in the third quarter gave Carolina a lead and snapped a two-game scoreless streak. The veteran back has had 15 or more touches in back-to-back games for the first time since Weeks 1 and 2, but it's fair to wonder when Carolina will turn the keys over to rookie Christian McCaffrey. Stewart has more games with under two yards per carry (four) this season that games with four or more yards per carry (three). Stewart rushed 17 times for 110 yards in Monday night's 45-21 win over the Dolphins. Analysis: Stewart followed last week's uncharacteristic, two-fumble outing by having his best performance of the season. Prior to Monday, the veteran hadn't topped 50 yards since Week 4, and had totaled just 120 yards in five games since then. Although backups Christian McCaffrey and Cameron Artis-Payne both rushed for touchdowns, Stewart should still be rather satisfied with his latest showing, which will see him enter Carolina's bye week on a high note. Stewart rushed 11 times for 21 yards and lost two fumbles in Sunday's 20-17 win over the Falcons. Stewart (toe) practiced in full Thursday, Steve Reed of the Associated Press reports. Analysis: For four weeks running, the Panthers have included Stewart on the injury report, but he hasn't logged anything less than a limited practice at this point. With his health not in question again, he's poised to act as the Panthers' primary running back, which has afforded him 13.8 carries per game this season. If the trade of Kelvin Benjamin spurs the offense to throw downfield more often, Stewart may actually have more room to operate moving forward. Stewart (toe) was a limited practice participant Wednesday, Jourdan Rodrigue of The Charlotte Observer reports. 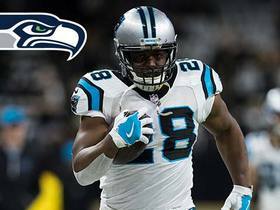 NFL Network's Mike Garafolo reports on today's meeting between the Seattle Seahawks and former Panthers running back Jonathan Stewart. 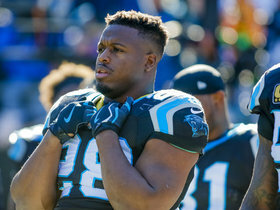 NFL Network's Tiffany Blackmon explains how the Carolina Panthers will replace former running back Jonathan Stewart. NFL Network Insider Ian Rapoport explains why the Panthers released running back Jonathan Stewart. 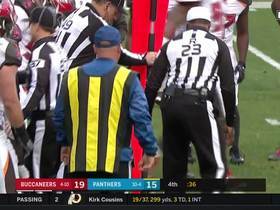 NFL Network's Kay Adams explains why Panthers running back Jonathan Stewart is the one thing to watch for in the Panthers vs. Falcons Week 17 matchup. 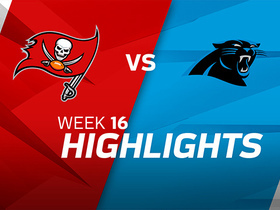 Check out the highlights from the Week 16 game between the Tampa Bay Buccaneers and Carolina Panthers. Carolina Panthers running back Jonathan Stewart pushes his way to clutch first down. 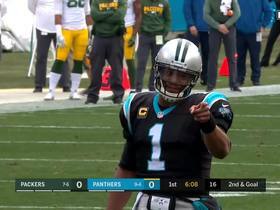 Carolina Panthers quarterback Cam Newton tells teh Green Bay Packers defense a funny statement. 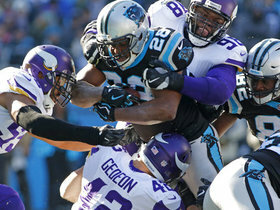 NFL Network's Kyle Brandt talks about what he learned in Week 14 about Panthers running back Jonathan Stewart being one of the great goal-line leapers. Week 14 of the 2017 NFL season was filled with overtime thrillers, snowy conditions and playoffs spots on the line. Here is a look at the top plays.